It is a better way to provide tours for your tour groups. Tour guide system is an easy-to-use wireless communication system designed specifically for tour groups, factory tours, outdoor excursions, employee training, language interpretation, conferences and trade shows. Integrated rechargeable Lithium battery, only 4 hours charging time. 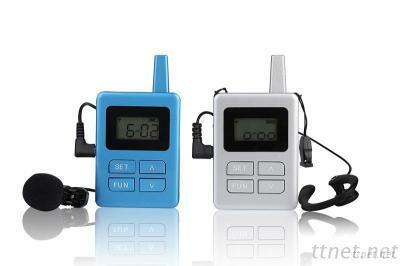 LCD display for battery power, channel, volume, very easy to operate. UHF for international free frequency license. 100-150 meters range from the transmitter to receivers. 6-100 independent channels to choose, up to more than 20 groups work simultaneously at the same location. Back with belt clamp for easy carrying. Teaching training: Schools, training institutes, conference rooms, auditorium, classroom lectures, seminars and other learning activities, special job training.